This recipe was shared with family in friends in loving memory of Aunt Mildred Marie Guinn Stoots, my Aunt. Every time we visited the family in east Tennessee, my Mom would head over to Uncle Leonard and Aunt Mildred’s house on Sunday. After church they would always have a big late lunch. With 8 kids, you can be assured it was BIG. Especially when they grew up and brought friends home. I loved the smell of their house. Especially when Aunt Mildred was baking bread for the Sunday dinner. I really miss both of them. We lost our precious Mildred in January 2009. And we happily share our memories of her kitchen with the world. Dissolve yeast in warm water. Don’t boil! Add sugar and salt, mix well and allow all ingredients to dissolve. Pour the liquid into a large mixing bowl. Add shortening, then gradually fold the flour into the mix to make a stiff dough. Place the dough ball in a large lightly greased bowl. Turn the dough in the bowl to grease the entire surface. Cover with a light weight towel and place in a warm location. (We sat the bowl on top of the stove). Let stand until the dough ball has doubled in size. Approx 1 hour. Turn the dough ball out onto a clean floured surface. Knead the dough several times. Divide into 3 equal parts and form into a loaf. Place the loaves in each of the greased loaf pans. Brush the tops of the loaves with melted butter. 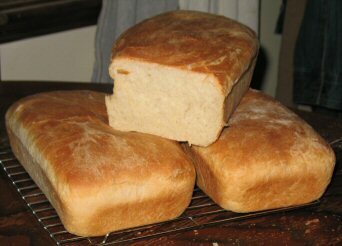 Place loaves on top of the stove, cover each with a light weight clean cloth and let them rise. (Approx 1 hour). Bake at 350° F for 25 to 40 minutes. Remove from oven and turn the loaves out onto a cooling rack. Serve warm or cold with your favorite topping or for your favorite sandwich.